Like many sewing bloggers out there, I am under the spell of Hisako Sato's Drape Drape series of pattern books. The books had been sitting patiently on my shelves until last weekend I decided to make a dress; I attempted to sew pattern no.3 from the first book, waste gather drape dress. According to the size chart (shown below), with my height of 177cm, bust 86, waist 73, hip 97, my body measurements put me somewhere between L and XXL :) From the very beginning, I had a gut feeling that something would go wrong. When I drafted the XL size, I automatically added 3cm of seam allowance in case I needed some extra fabric, even though the general recommendation for knit fabric is to draft one size down due to the stretch properties of knits. 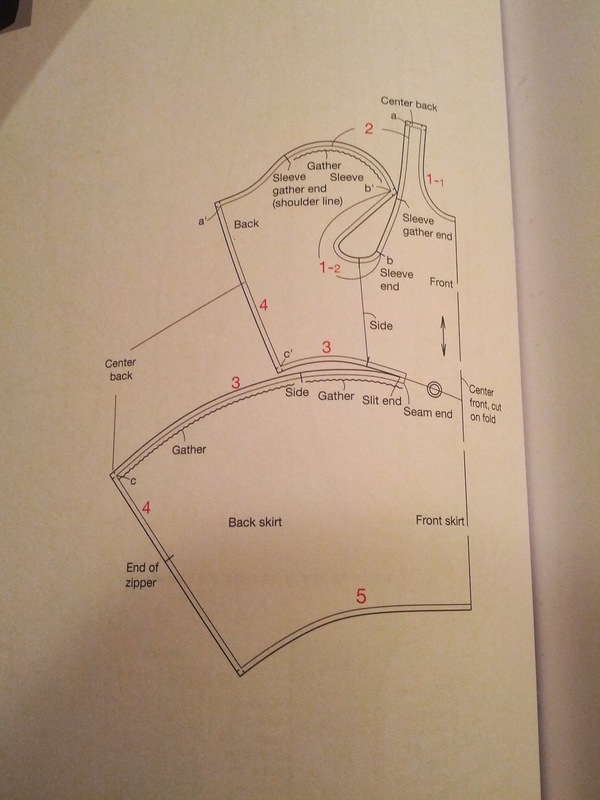 The biggest difficulty at that stage was that I was not able to properly measure the size of the finished garment due to the complexity of the pattern vs standard bodice shapes. Also, when I laid out the pattern, I came to the conclusion that if I cut the dress as one piece, the waist would be situated somewhere below my bust. So I cut two separate pieces, a bodice and a skirt, adding 5cm to the bodice and 5 cm each to the top and bottom of the skirt. But these two actions slightly affected the balance of the lines and you can see on the two pictures below the problems with the dress. 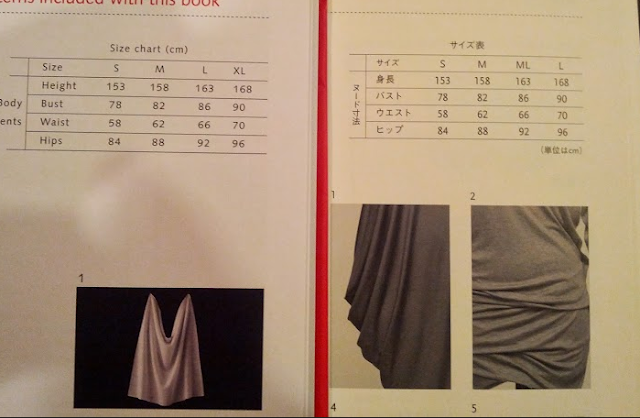 I looked up how to remedy the neckline in different fitting books and re-sewed it twice. It now gapes a little bit less but you still can see there is something wrong with it. Currently the neckline is not stabilized but its finish is a tiny rolled hem. Maybe I could add some knit stay tape and when attaching it pull it in order to gather the neckline a little bit. Do you think it might work well? As for the rest of the dress, there are no major problems. The skirt fits well but it does not hug super tightly. Because I had enough troubles with the neckline, I decided to to put more stress on it and omitted the invisible zipper. Only now I realized that I did not take pictures of the back. During the "photoshoot" I was so concerned with the neckline that I completely forgot about my rear. The biggest conclusion that I drew from this project is that I still don't know a lot about knits, especially when it comes to problems with fitting and deviation in proportions. Also, I should have analyzed this pattern with more attention before constructing the garment. Moreover, I did not make a muslin as I usually would. Luckily for me, I've got 1.5m more of the same fabric and my next knit project will be based on a simpler pattern! 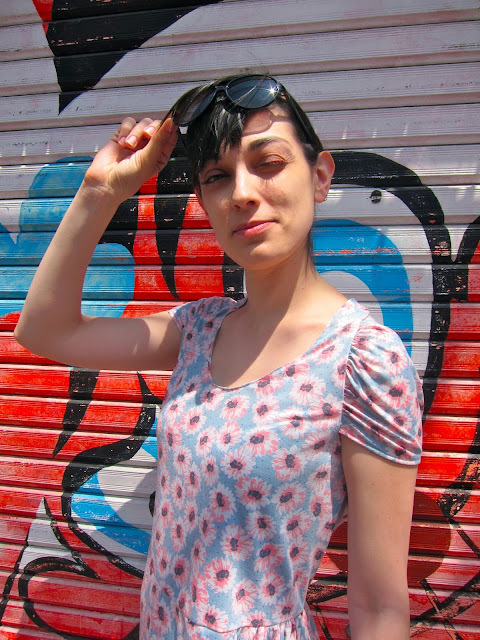 In Tokyo, summer is in full swing. As you can see from my pictures, flip-flop season is beginning! Which summer knit dress pattern would you recommend? I'm glad you are going to give it another go as it has loads of potential. Despite the gaping in the neck the fit across the shoulders now looks spot on. I do love that drape drape book and have made up one from DD2. I needed to tinker with the fit as well - and then realised it just wasn't me... but that would be a good knit dress. Oh this dress looks so pretty on you! You successfully modified the pattern. By the way, how are the fabrics in the book and of yours? The fabric on the book looks so thin (I can see the contours of legs!) and soft, that it should stretch a lot! Also, the dress on the book looks more smaller (i.e., fitted ) for the model, especially around shoulder, than your dress for you. So I just wonder whether difference of fabric's stretches caused the big difference in fitting? her ear. She never wants to go back! LoL I know this is totally off topic but I had to tell someone! Im really glad you posted this when u did! I think I will make this dress this week, and was wondering about a lot of things u answered! I think in the end it turned out quite nicely, and the thing ive found with knits a lot is.....there is a lot to learn and mistakes will inevitably happen! or at least it has with me! I am glad I addressed some of your questions in this post :-) You are so right about knits: learn by doing! it, you will be a great author. I will be sure to bookmark your blog and definitely will come back very soon. I want to encourage one to continue your great writing, have a nice holiday weekend! bei meiner kleinen Hobbyhure direkt im Schlafzimmer. dieser live sexchat ist - schon zeit nehmen.